The Olympic Wall, which was initially planned for the grounds of City Hall in Hamilton, will now be located at the National Sports Centre, the Bermuda Olympic Association said today. Multiple Olympic medalist [in long jump and heptathlon] Jackie Joyner-Kersee of the United States has accepted the invitation of the Bermuda Olympic Association [BOA] to visit Bermuda as an honoured guest for the day of celebration. A BOA spokesperson said, “Highlights of the day will include the unveiling of an Olympic Wall, a youth sports clinic at the National Sports Centre led by Mrs. Joyner- Kersee and a gala 80th anniversary banquet at the Fairmont Southampton, where Mrs. Joyner-Kersee will be the guest speaker. “The Olympic Wall will consist of a fortified concrete base with six standing granite tablets of varying heights which will be engraved with the names of all of Bermuda’s Olympic Games participants to date, including those who recently represented the Island in Rio de Janeiro this summer. “Olympians’ names will appear on both sides of some of the tablets which are also designed to accommodate the names of future Olympians. “Originally, the Wall was to have been installed on the grounds of City Hall in Hamilton, but after the review of a number of factors, it has been determined that the Wall will be located at the National Sports Centre in a beautifully landscaped setting on the Roberts Avenue side of the NSC near the entrance to the National Aquatic Centre. “As a monument to sporting achievement, this is an appropriate location for the Wall; visible to both local and international sports spectators and the many young people who train at the NSC. 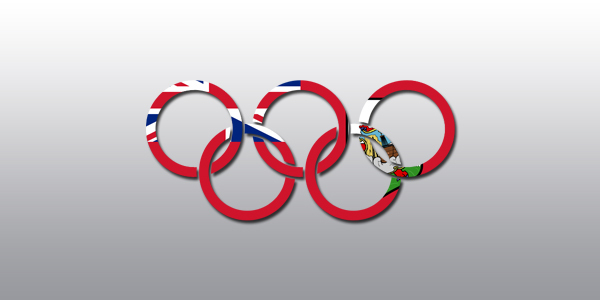 “It will be a permanent tribute to those who have had the privilege of competing and participating in the Olympic Games and will inspire future generations of Bermudian Olympians. “The BOA is grateful to the Trustees of the NSC for giving their approval for the Olympic Wall to be located on its grounds. The BOA is also grateful to the design team from OBMI Ltd. and Sticks and Stones, a Bermuda company specialising in the import of granite and other materials, for their assistance in this most important project. Maybe Sylvan Richards and his bag carrying private secretary would like to make a substantial donation to the Bermuda Olympic Association. Given that the Government has had to cut back on funding for sport, such a donation might allow some of our talented athletes to train and travel to future Olympic Games – albeit not in the style Mr. Richards is obviously accustomed to. Notice our only Olympic medalist was not mentioned. Fitting location for it as City Hall is better represented by the Arts Community. The money should be spent on something more beneficial like, well, I dunno, hmmmm, lets see, I know. Lets spend it on sending Ministers & their PS’s on junkets here & there. Don’t want to hear the BOA complaining about being underfunded if they have money to waste on a wall naming anyone who ever went to the Olympics. No problem with honouring medal winners, even those who reached finals.